I received the "R" version plans in the mail back in October '05. 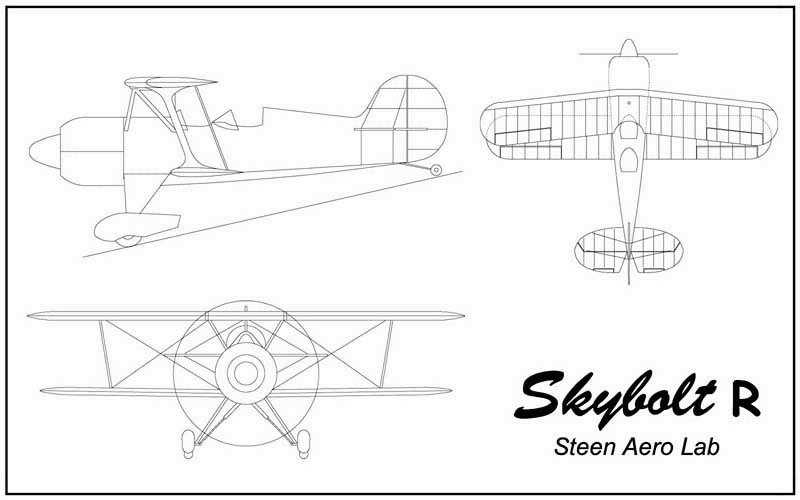 I'm glad Curtiss Pitts drew these up for Steen Aero Lab. 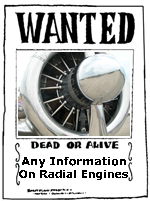 The few guys who have hung radial engines on the front of their Skybolts have had to work through some technical issues that I really didn't feel like dealing with. Update: December 16, 2006. Just heard in the biplane forum about updated CAD drawings for the 3-piece wing. Called Steen Aero and spoke to David Stone and yes there are updated drawings. Explained to David that I purchased the R plans supplement for $65.00. The new, updated supplement is 100 dollars so he said for the difference, 35 dollars, he'd send out the updated drawings to me. Went online and ordered... got the new updated drawings AND a 2006/2007 calander with the cut-away drawing of the 'bolt as the pictures on it. Sweet ! Looks like I'll be attempting that 3-piece wing now. Thirty pounds heavier but much stronger. If it weren't for Curtiss, I'd be building a conventional Skybolt. A beautiful bird, just not the one I wanted to build. The "R" version has a totally new fuselage. Not a modified Skybolt design. Along with the "R"adial engined fuselage I got blueprints for the 3-piece wing. Not sure if I want to go there with this. There are several areas on the blueprint that need to be worked through. Decision still up in the air on that one. The new design was based on using the Vendenyev M14P nine-cylinder radial engine, both the 360 and 400 horse powered units. Some stats on the plane. Upper Wing Airfoil is a NACA 63zA015 with a sweep of 6.5 degrees. Fuel capacity is 35 gallons with an additional 18 gallons optional. (for those long cross-contires) :: Update:: Only a 29 gallon main tank. It's going to be awhile before I'll load something up to this page. I have plans on welding up the fuselage this winter/summer. I have my tubing list already made up for what I need to order from Dillsburg Aeroplane Works. Cheapest, and best 4130 tubing around. Drove over to Gus' today. Picked up a boat-load of airplane stuff (actually a pick-up truck load.) And with that heist I received two custom made tables for fuselage building. It's been good to Gus for four biplanes, I'm sure it'll treat me just as nice. I'll be painting over the old drawings with white primer and starting to draw the lines for the R version of the Skybolt in a few days. Never thought that I'd be doing this... cutting tube and welding up a fuselage. Can't wait to get started ! Looks like I've already written down the word. Did it on the 4th of August. Duh.... looks like I'd better get started then ! I'm to the point in my welding were I can take on welding up a few pieces. I'll be starting with the rudder pedals. They're small and if I make a mistake it'll be a small mistake. Make that mistake on the big ol' fuselage and it'll be a big mistake. I've been sitting here during my lunch break looking over the rudder pedal drawings. There's a lot to those drawings - and I'm only talking about the small rudder pedals. If you're like me, you just want to dive head first into it... sorta like when you'd put things together out of a box... don't read the directions just start putting it together. Not so with building a plane. You need to sit back, look at the plans, think about it, map out a course of action you'll take, sit back and and look at them again, scratch your head and wonder if you're really reading these right. A picture is worth a thousand words... trite but true. I've been lucky enough to have access to the photo gallery on the biplane forum. A few areas that I wasn't exactly 100% about with the rudders was quickly cleared up by just viewing both Al Rice's and Manuel Benito's rudder pedal photos. Thanks guys ! I have plans of making the simple jig and welding up (at least starting to tack weld) the rudder pedals this weekend. Wish me luck. Read about the Rudder Pedals.... click here ! Some up dated information about the fuselage on the next page.